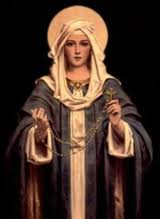 The Fifteen Promises of Our Lady to Those Who Recite Her Holy Rosary | Cause of Our Joy! Our Lady of Fatima, You have deigned to come to Fatima to reveal to the three shepherd children the treasures of grace hidden in the Rosary. Inspire my heart with a sincere love for this devotion, in order that by meditating on the mysteries of our Redemption, which are recalled in it, I may be enriched by its fruits, and obtain peace for the world, the conversion of sinners and of Russia, and the favors which I ask of you in this Holy Rosary.